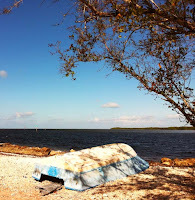 I love the Conch Republic, better known as the Florida Keys. Whenever I get the chance, I go down for the day to Isla Morada or for the weekend to Key West. It's laid-back environment can't be duplicated in Miami. Along US1, in Isla Morada, is a place called The Rain Barrel, a community of artists. It's impossible to miss The Rain Barrel, because there is a monster-size lobster which sits in front of the shops. There, you can buy anything from pottery, to paintings, wind chimes to baskets, jewelry to Key Lime coolers. And it is here where I have bought more than my share of Key Lime coolers. Now, it takes me at least two hours from Miami to get down to The Rain Barrel. It's a bit of a ways to go if I want some Key Lime coolers. 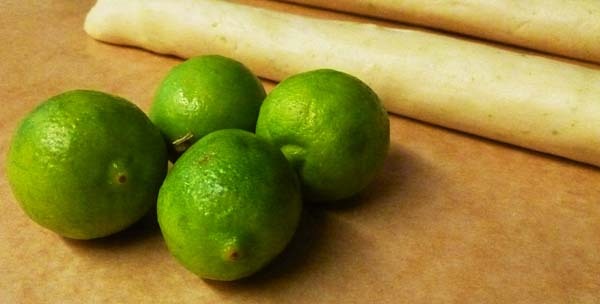 So, I decided that it was time that I came up with my own Key Lime cooler recipe that I could make at home on days when a drive down to the Keys, no matter how tempting, was not in the cards. 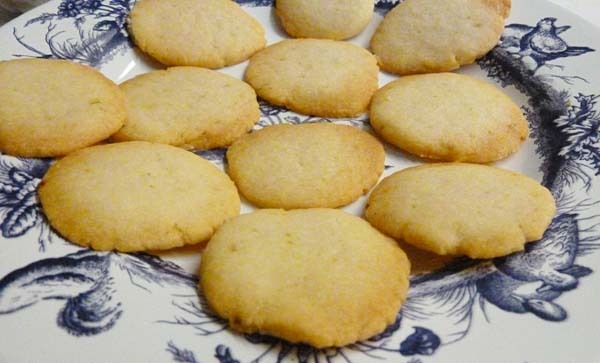 I turned the cookie into a thin wafer which is a crispy, delicious treat. The trickier part is finding the Key Limes which are necessary for this recipe. Most of them come from Mexico, and while they are easy to get in Florida, it may be more of a challenge in other parts. My advice is, if you find them, try this cookie. Lime juice from 1 Key Lime. Preheat the oven to 325 degrees. Grate the rind of 4 to 5 Key Limes, careful not to eat into the pith (the white part of the skin). 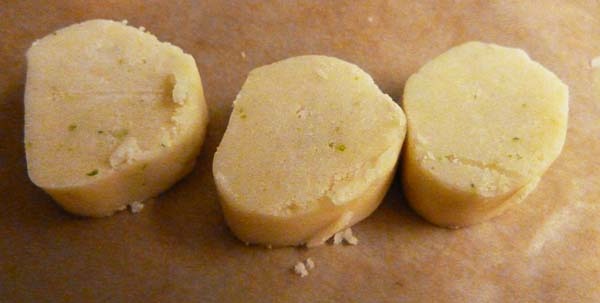 The Key Lime is very thin skinned and a slight amount of grating will reveal the pith immediately. Grate 2 teaspoons of rind and set aside. 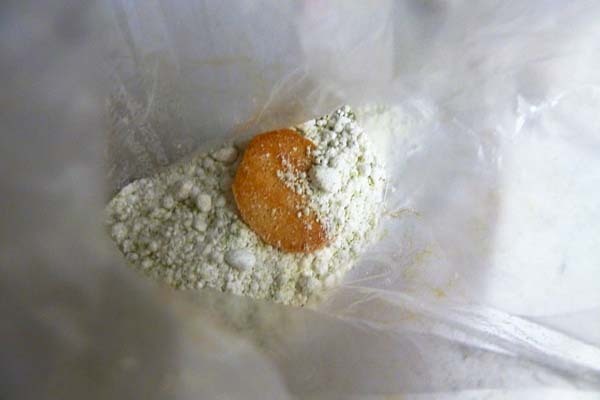 Squeeze 1 Key Lime into a bowl, careful to remove all seeds, and set aside. In a blender cream the butter. Add the sugar, Key Lime juice, and the grated Key Lime rind. Mix until everything is well incorporated. In parts, add the flour and mix. Remove from the blender and knead the dough on an unfloured board. It will be firm and fragrant with the aroma of Key Lime. Separate and make into two rolls. Place in the dough in the refrigerator for at least an hour to have it firm up. This dough also keeps well and can be stored for a few days prior to baking. Whether you wait for an hour or wait for a few days, it is best to make your Key Lime Powdered Sugar Topping at this time, because you want to give the powdered sugar time to absorb the Key Lime flavor and this will keep for a few days as well. That part of the recipe is explained below. When you are ready to make the cookies, take the rolled dough out of the refrigerator, and cut it up into small, thick slices. 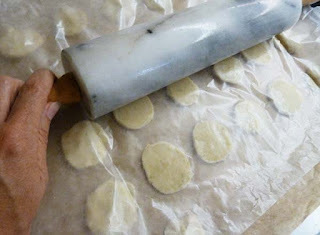 Place the sliced dough on a piece of parchment paper and cover with a piece of wax paper. Use a rolling pin to flatten the dough. It is important that each wafer be the same thickness, otherwise, it will bake unevenly, with thinner wafers browning more than thicker ones. Remove the wax paper and transfer the cookies on the parchment paper to a baking sheet. Put the baking sheet in the oven on the middle rack and bake for 12 -15 minutes or until they are slightly toasted on the edges. Keep your eye on these cookies. Since they are thin, you want to make sure they don't burn. 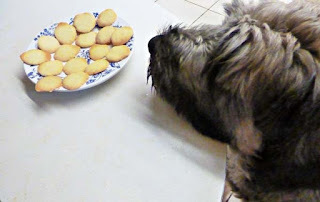 These coolers are some of my pups favorite cookies, and when I make them, there is a lot of activity in the kitchen from the boys. They love their Key Lime coolers! When they come out of the oven, you'll want to eat them right away, but resist! They have a delicious tart taste to be sure, but you want to add the Key Lime Powdered Sugar Topping for the deliciously seductive contrast. Place the powdered sugar in a plastic bag and set it aside. Grate the rind of two Key Limes, careful again not to incorporate the pith of the lime. With a mortar and pestle, crush the grated rind to extract the lime oil. You will smell the heavenly aroma of the Key Limes. Scoop out the rind Mix the grated rind with the sugar in the plastic bag. Let it sit for at least an hour to let the flavors blend. You will find that when the cookies come out of the bag, the dusting of sugar will be minimal. 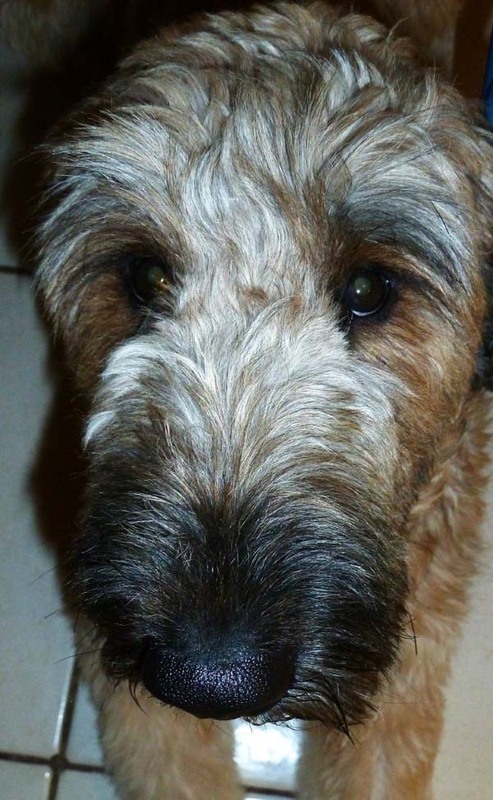 It provides only a very light coat of sugar. 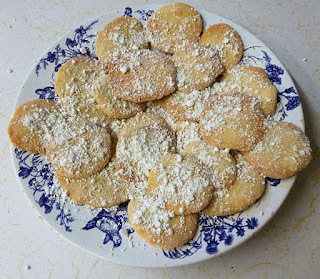 Move your wafers to a serving dish and then sprinkle the additional Key Lime Powdered Sugar Topping over the cookies. It will look like snow... Florida snow. Beautiful and totally delicious. This can also be served with a jam on the side. Any berry jam is a lovely complement. My mother has made blackberry jam as an accompaniment for these coolers and it sets off the lime flavor beautifully. And as for my boys, each of them had more than one cooler... A lot more! It was a feast for all. I love key lime! I will definitely try these - thanks for sharing!